脱ぎなさい！(Undress yourself!) Papa, don’t preach! “脱ぎなさい！(Undress yourself! )” That’s what Rae-chan was ordered to do by her own dad. And then he took pictures of her. So sick, incestuous. Child abuse. Oh, yes. 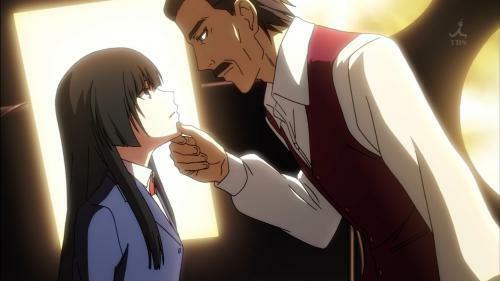 Sankarea does remind me of a very popular J-drama in the early 90s, Ie Naki Ko (Homeless Kid). It stars Adachi Yumi, who plays a loli protagonist, Aizawa Suzu. At that time, she was only a 12 years old yojo. And there was a wealthy art critic character in that drama, Ootsubo Eiji, played by Hosokawa Toshiyuki. He played a sadistic detective in a cult film of Kaji Meiko’s Female Convict Scorpion series, which Tarantino is a huge fan of. Rea’s daddy is exactly like Ootsubo. Basically, the premise of story is that Rea dies and resurrects as a zombie. The same goes for Ootsubo. He lost his daughter. So, he adopts Suzu the homeless girl. Yes, that’s what Rea’s father may do; adopt a homeless girl as a foster parent. Oh yes, I think this drama was a premonition. 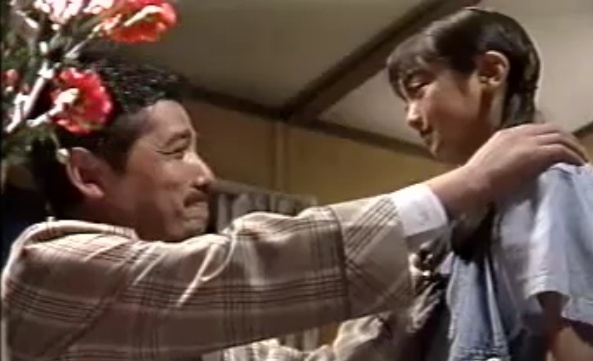 I think Rea’s father was modeled after Ootsubo. A mannerism of speech is so similar. I think the seiyuu studied Hosokawa’s acting or inspired by it. “Undress yourself.” I can’t help but laugh. That wording is so strange in Japanese. Because nobody in real life uses that wording. I mean I never heard anybody say it. It sounds so weird and perverted. Oh, yes. This reminds me of Esper Mami, a Fujiko Fujio “F” anime from the Showa. Mami is a daughter of the painter. And everyday after school, Mami always undresses in front of her dad to be his model. Her dad is really sick and should be put behind the bars. Why does a daughter need to be naked in front of her dad? Just like Eve, she was always naked in front of Yahweh. But one day she bit the apple and started covering her private parts. “Where are you? Why are you hiding from me?” Of course, reaching adolescence, just started learning onany, kids need privacy too. But Yahweh disowned her. Rae declared to her father, “I don’t want to be naked for you anymore.” Then, Papa got mad. And she died. But Chihiro, a son of the Buddhist priest, probably from one of the Pureland schools, most likely Jodo Shinshu, since the mantra they chant is “Namu Amitaba Buddha,” resurrected Rea like Jesus revived Lazaro. 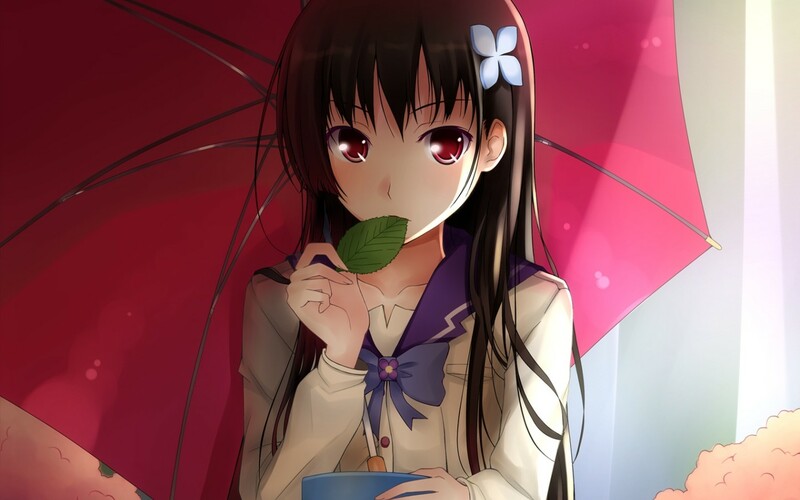 In Rea’s case, the apple is Ajisai, the flower which leaves are poisonous. She was told not to eat Ajisai by her dad. And the drug to make a zombie is made from Ajisai. Yes, Rea’s dream was to live like a normal girl, and enjoy romance as an otome. So, Ajisai was the gateway to that, but at the same time lethally toxic! So true that eros and thanatos are intertwined! Yes, Ajisai is a symbol of pain and bitterness. 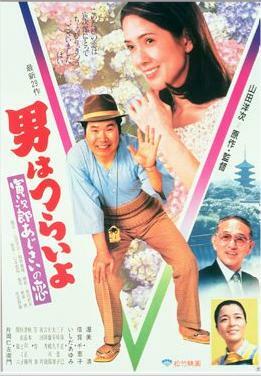 The Tora-san series had an episode, Ajisai romance. That’s where Tora-san gets turned down by Kagari, played by the legend Ishida Ayumi, a famous singer for Blue Light Yokohama, which was also featured in UN-GO. Also, Ajisai is a symbol of loss of innocence for Rea. Or loss of childhood innocence, i.e., loss of being a daddy’s girl. Yes, her childhood is over. Death of childhood and birth of adulthood, dusk and dawn, moratorium of bittersweet. But that initiation process is quite rough. “Undress yourself!” That’s a code word for “possession.” Like mistreating POWs, the conquistador kept them naked. That’s what happened in Iraq to POWs, making them naked surrounded by barking dogs. Patriarchs always want to undress girls. 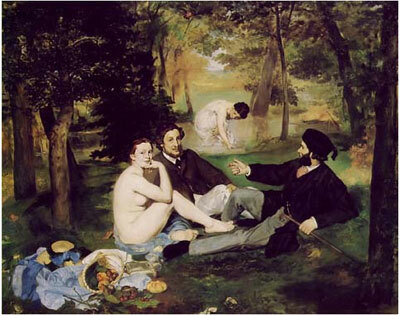 A naked girl at Luncheon by Manet. A very sexist picnic indeed. Wow, looks like I have a lot of catching up to do.